It's been almost a year since Yours Truly KJS bumped into Starflight chief pilot Jib Khan and spent an evening propping up a bar in Hammersmith on the eve of a certain much anticipated gig at Wembley Stadium. We talked on many subjects that night, one of which was how Jib was going to follow up his impressive 2015 album "World Premiere" (see my elobf review here). 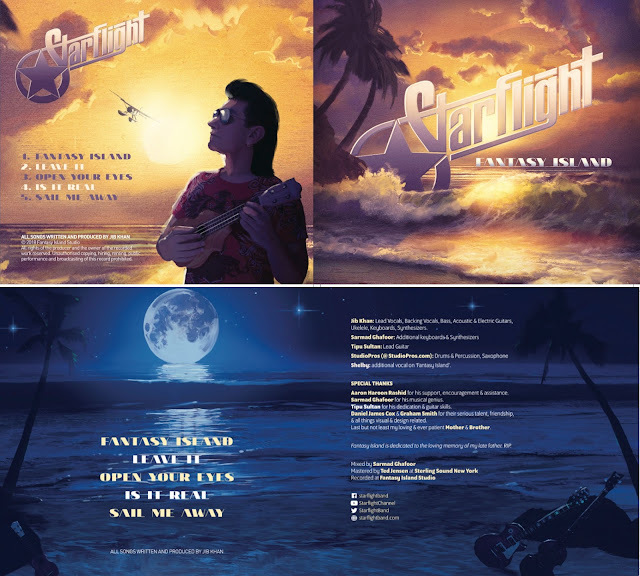 Fast forwarding to the present day and the answer to my question is a new five track EP entitled "Fantasy Island" with Starflight now a duo again with Sarmad Ghafoor aboard. "Fantasy Island" is a smooth affair with a sweet vibe throughout, dabbling in ELOesque themes, Power Pop, rock and romance. The opening title track oozes class and the ever increasing musical talent of this Aussie artisan with a feel not unlike ONJ's "Magic" as found, of course, on the "Xanadu" OST. "Leave It" is perhaps the most catchy song on offer with its optimistic enticement to drop everything and enjoy life to the full. Typical Jib, typically Starflight! Fourth track "Is It Real?" is another up tempo tune, delving into rock territory whilst reminding this writer a little of Jeff Lynne's "Let It Run" in places and definitely a nod to ELO's classic stompers. elobeatlesforever (elobf) recommends "Fantasy Island" by Starflight to those enlightened folks who enjoy the music of ELO, Jeff Lynne, Roy Wood, The Move, The Idle Race, 'Brum Beat', The Beatles and related artistes.